Agile is an iterative approach to software product development. It helps project teams deliver value to their customers faster and better. One of the key agile principles is to deliver work in small, testable and manageable scale. Instead of upfront requirements identification, agile emphasize the continuous discovery and identification of requirements throughout a project. Agile teams can react to change faster and easier. What is this agile tutorial about? This is a step-by-step agile scrum tutorial that helps you understand the core concept of agile development as well as the way how agile project can be executed from the beginning until the end (i.e. product delivery). 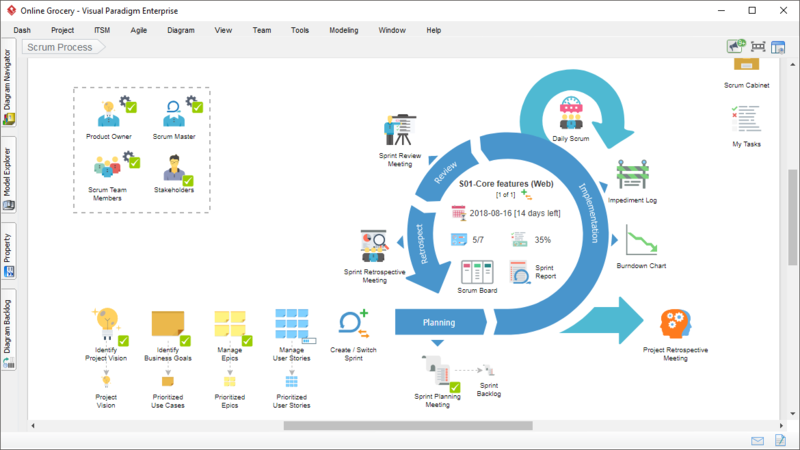 The agile software Scrum Process Canvas will be used throughout this tutorial. The whole agile scrum tutorial will cover various agile topics and it is recommended that readers read this scrum tutorial in order in order to fully understand the flow of agile project development. This agile tutorial has been written for both the people below. There are totally twenty lessons covered in this agile tutorial. Click on a lecture to begin.